In We’re No. 1, The A.V. Club examines an album that went to No. 1 on the Billboard charts to get to the heart of what it means to be popular in pop music, and how that concept has changed over the years. In this installment, we cover Pink Floyd’s The Division Bell which went to No. 1 on April 23, 1994, where it stayed for four weeks. “Is this still really Pink Floyd?” is the opening line from Rolling Stone’s original review of Pink Floyd’s 1994 album, The Division Bell, an album that rocketed to No. 1 in the U.K. and the U.S. while going double-platinum the year it was released. The sales numbers are clear: There was still an appetite for a Pink Floyd album—an observation bolstered by the fact that the album later went triple-platinum in 1999—even if Roger Waters was no longer a member of the band, and the remaining members collaborated with a number of outside musicians to create the album. More than just a representation of the purchasing power of baby boomers, the commercial success of The Division Bell was an early indicator that actively marketing and selling nostalgia would soon become the most profitable way forward for a struggling music business. By the time Pink Floyd was in the process of recording The Division Bell, it had been eight years since bassist and songwriter Waters had left the band. 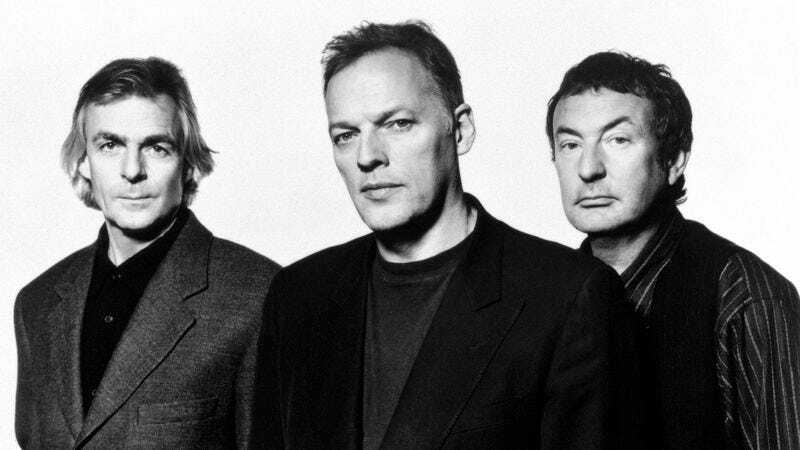 The remaining members had previously released the underwhelming A Momentary Lapse Of Reason in 1987, an album that was a David Gilmour solo album released under the Pink Floyd banner. There’s a lot of dull guitar atmospherics and droning tones. Couple that with Gilmour’s less acerbic and evocative lyricism, and the result is the first album in a storied career that doesn’t feel like a Pink Floyd album. Even 1983’s The Final Cut, which is often cited as Waters’ de facto solo album—a record that Gilmour has, as quoted in Nicholas Schaffner’s A Saucerful Of Secrets, described as having “too much filler, [and] meandering rubbish in between songs”—has a sonic and thematic energy that’s reminiscent of the best of Pink Floyd. Waters leaving the band set the stage for the 1987 release of A Momentary Lapse Of Reason, and its success (it went double-platinum the same year) suggested that even without one of the band’s primary songwriters and vocalists, there was significant demand for more Pink Floyd. The Division Bell proved that even seven years later, the market for a Pink Floyd release hadn’t receded. Despite being an album that boasts the underwhelming sonic qualities that define post-Waters Pink Floyd—wandering atmospherics, undercooked imagery, and Gilmour’s thin (compared to Waters) vocals—the album went straight to No. 1, something A Momentary Lapse Of Reason hadn’t achieved, largely because of the mammoth success of Michael Jackson’s Bad at the same time. Despite the commercial performance, it’s hard to find diehard fans of The Division Bell, and even more difficult to find fans who see the album as occupying the same hallowed canon as The Dark Side Of The Moon or The Wall. So if the album isn’t worthwhile in terms of the music, and doesn’t even suggest much about the legacy of Pink Floyd, what remains important about it, beyond being a historical document that suggests people once purchased music? Well, the success of the album, in many ways, predicted and paved the way for a market of nostalgia capitalization that would come to a head in the coming years. As physical album sales dwindled with the rise of peer-to-peer sharing, record labels and artists had to find other ways to secure profits. In 1994, no one was battling the Internet and file sharing just yet, but there was an industry lesson to be learned from the success of The Division Bell that would be applied in the coming years: More often than not, a band’s name, and all the cultural cachet it holds, is more important, in a commercial sense, than the band itself. CBS Records couldn’t care less whether Waters was involved in the recording process of a new Pink Floyd album. The label wanted another set of tracks to slap the Pink Floyd name on, because it was (and is) a name that carried significant weight, with a built-in set of signifiers that meant something to a particular audience. Such a commercial and impersonal view proved to be the way forward for the music industry as the years rolled on. Moving into the ’00s, reunion tours and special festival sets, paired with a renewed interest in vinyl and the ludicrous promotion of 180 gram pressings of a band’s back catalog, proved to be one of the few ways to turn a substantial profit in the music industry. It’s a strategy reliant on brand recognition and residual affection. The Division Bell was by no means the first album to capitalize on the cultural cachet of a band’s name, but its commercial success in an industry only a few years away from a massive shakeup positions it as a harbinger of the vacuous nostalgia-industrial complex that was right around the corner.